Shades of Venice & Persia! 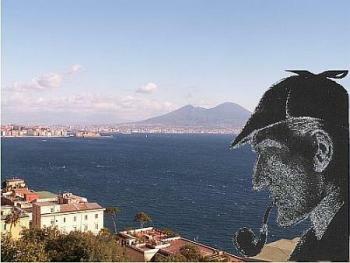 This has cost me a few beers and an entire morning at the bar consulting my version of Holmes' Baker Street Irregulars! There are two parts: mechanical and etymological. —(3) close like solid doors. 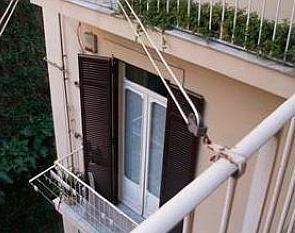 So, at least in Naples, if they are on the outside, have louvered slats, and open and close on hinges or a slide mechanism they are some sort of persiana. 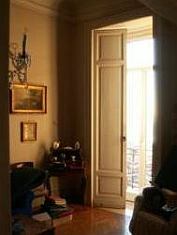 If they are solid door-like closures (not shown above) and meant to keep out light and air, they are called scuri (plural), a word that, appropriately, means dark. On the inside, such solid hinged shutters (photo 1) are called imposte (plural) or scuretti (although a number of persons I talked to had never heard the term scuretti). Thus, anthing except a solid door-like closure on the outside is a persiana, whether recessed in the wall when open and then slid shut (as in photo 2, where the right-hand section is partially closed) or whether they swing out like doors to the outside (photo 3). Question: Persiane, clearly from Persian, but what is the origin of the word being used in Naples/Italy? Arabs in town? 'Persian blind' exists in English, but I only know that because I looked it up. I had never heard it in English. Apparently, it's a translation of the French persiennes; and my OED has this: "[Fr., pl. fem. of adj. persien, Persian.] 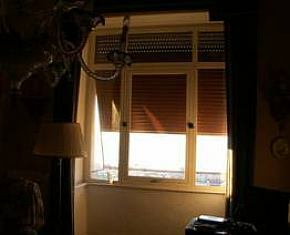 Outside window-shutters or blinds, made of light laths horizontally fastened in a frame, so as to be movable, like those of Venetian blinds." Various uses from the 1800s are given. I am pretty sure that the use in Italian —and in Naples— has nothing to do with the presence of Persians or Arabs in Italy, but is some sort of cultural borrowing from French. There are all sorts of things supposed to be "Persian"—carpets, cats, beds, blinds. I think it must be sort of a language affectation. We imagine them to be Persian. Whether they really are is another question. An Iranian might know. "I wonder what that fellow is looking for?" I asked, pointing to a stalwart, plainly-dressed indidual who was walking slowly down the other side of the street, looking anxiously at the numbers. He had a large blue envelope in his hand, and was evidently the bearer of a message. "Even across the street I could see a great blue anchor tattooed on the back of the fellow's hand. That smacked of the sea. He had a military carriage, however, and regulation side whiskers. There we have the marine. He was a man of some amount of self-importance and a certain air of command. You must have observed the way in which he held his head and swung his cane. A steady, respectable, middle-aged man, too, on the face of him — all facts which led me to believe that he had been a sergeant." Question: "...and saracinesca from Saracen? Is that from the rule of Napoli by the same? What is the origin of this kind of roll-up covering?" "Arabs in towns" might account for that type of roller-shutter known in the south as a saracinesca. "Saracen" itself is said to be a corruption of "Syria" and in Italian history has really meant Muslim invader, both Arabs and Ottoman Turks. Then, you have to decide whether we call it a saracinesca because the Arabs invented it. That's possible, but then you are left with the question of why the device is used only when you are talking about the entrance to a building and not about the same thing on a window. That suggests, perhaps, that it was used to keep Saracens out! Maybe it's a functional definition (defined by "destination," as suggested above), as with Saracen towers; the Saracens didn't build them; they were used to watch for Saracens. 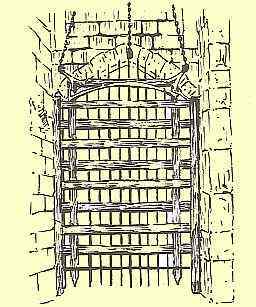 The saracinesca, as noted, is just a modified portcullis, the old castle draw-gate. The variation being that the Neapolitan saracinesca winds around a spool instead of sliding straight up and down. Question: Who came up with the idea of a canvas strap raising and lowering a strip of slats...via the Moors in Spain before they were dispatched back to North Africa thence to Napoli by the Spanish rule? 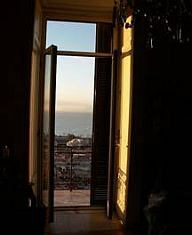 Speaking of blinds, the adjective blindato occurs in Italian, but only by extension does it have anything to do with "blinds" (as in Venetian blinds). In Italian blindato means "armored" (as in mezzo blindato—armored vehicle). There is a place in town that sells safes and strong doors that calls itself the "Blindhouse," though to most English speakers, including me, that suggests "house of the blind" rather than a place where they sell safety doors. By an even more roundabout path, it is probably related to the English blind ("sightless") since the word seems to be from of a very old Aryan root meaning "to darken." (pronounced: bai 3 ye4 chuang1) is the Chinese Mandarin phrase for "Venetian blinds." The characters mean "hundred-leaf-window." I thought that maybe since Marco Polo was Venetian, when he went to China maybe he picked up some blinds in Persia on the way out or on the way back and... Alas, no, but "hundred-leaf-window" has its own charm about it. I can see them on the windows! the national epic poem of Persia. I may be (or not) closing in on what modern Persians (Iranians) call persiane. (I have found out, for example, that a "mosquito net" is called magas kosh, and one phrasebook with a real sense of humor actually told me how to say My hovercraft is full of eels. Thank you, but not interested. I want persiane.) Although someone has suggested to me that persiane are called "Ayatollas"—from "Ayatollah you to close the blinds," I suspect that someone is just yanking my cord. Now, Alan F. (thank you!) tells me that Venetian blinds in Persian are called kerkeré. (The word for shutters is forthcoming. While I am waiting, I am going to worry about the similarity of kerkeré to Italian carcere and German Kerker (cognates from Latin, carcer) meaning prison and about whether that -é is an enclitic gentive. Also, I now read that in English there is something called a "Roman" shade: it's a single piece cloth shade divided into horizontal sections along the length by staves or rods. When it is completely extended on the inside of a window, it keeps out light. As you pull it up, it "pleats" together neatly as it rises. It's like having a skinny accordion hanging on your window. No one I know can tell me why it's called "Roman." I've just called a friend in Rome and he said—and I quote—"What are you talking about?" "You know, the kind that folds up like an accordion." "You mean plissè shades? It's French; it means "crease" or "fold." "But we call them Roman shades!" I protested. "Really. And do you know what we call a fruit salad in Italian?" "And do you know what they call that same thing in Macedonia?" (No, don't click on that. That's the sound of him hanging up. 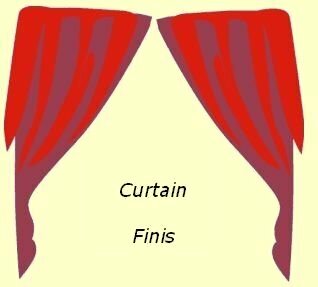 I am going to call him back and point out that he missed a Thomistic distinction: plissè shades fold up from the bottom, like Venetian blinds; "Roman" shades start to fold from the top, thus always leaving a smooth section at the bottom as the shade is drawn up. Touché.) On the other hand, he may have a point: with my informants now reporting from all precints, it may be that the wooden shutters that we call persiane in Italy are called by modern Persians (Iranians) in modern Persian (Farsi), simply, kerkereh choobi. That means...(wait for it)..."wooden shutters." Shades of Macedonia.